The Builders Exchange IPIN system provides multiple options for viewing and downloading project plans for members with upgraded memberships. In this IPIN Tip of the Month I will cover each of these options and the primary differences between them. 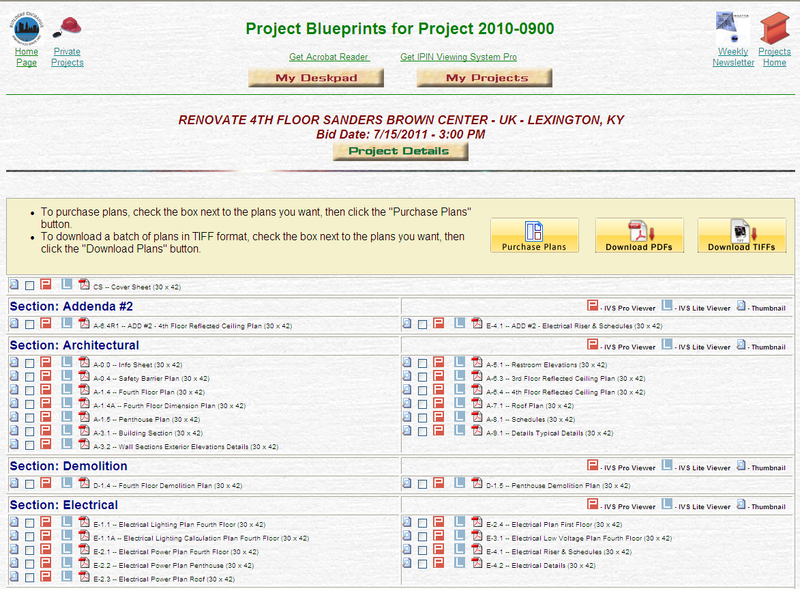 The Plans page (seen above) can be accessed by clicking on the “View Plans” icon located in the Project Details page of each project. 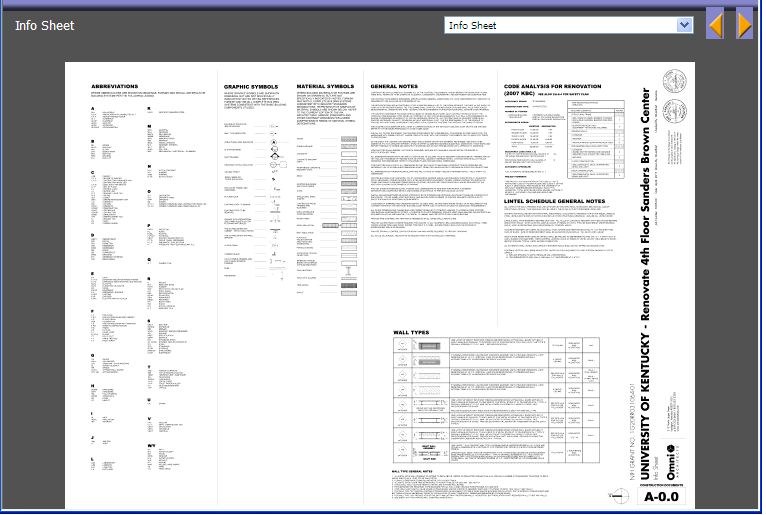 Each plan is separated and grouped by trade section and is labeled with its name and index number along with the size of the blueprint. 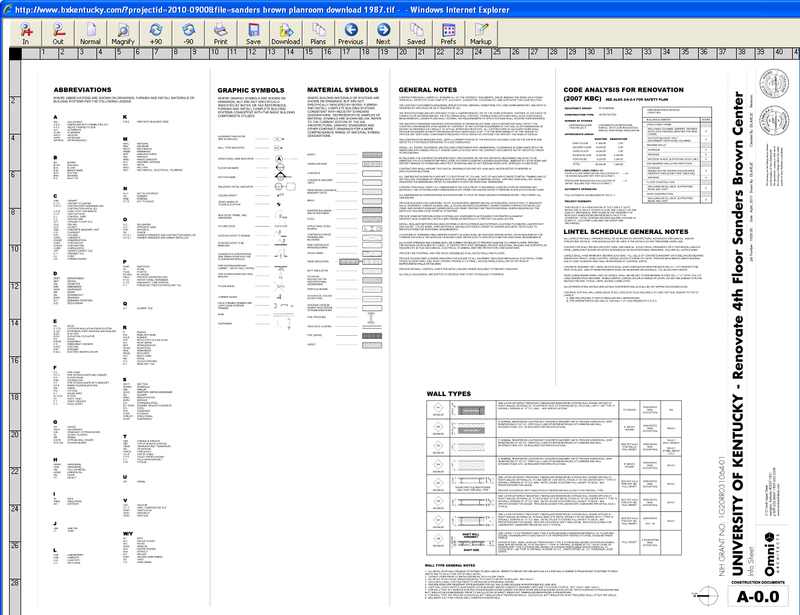 To the left of each blueprint are five different icons which each provide different ways to view or download the document. The first icon generates a Thumbnail View of the plans. This is the only option for viewing plans available to both members with and without upgraded memberships. The thumbnail viewer generates a small pop-up window allowing members to scroll through each drawing to obtain a preview image of the contents of the drawing. Each plan is accessible through a dropdown menu on the top right of the pop-up. Members can also scroll through each plan one-by-one with the arrow keys to the right of the drop-down box. The thumbnail provides members with a quick, easy way to obtain a preview of each plan before ordering blueprints, but it does not provide enough detail to do takeoffs, read fine details, or markup drawings. Clicking on “Purchase Plans” gives members the option to purchase hard copies of each plan. Clicking “Download PDFs” or “Download TIFFs” will prompt members to download and save a compressed zip file which will contain each checked plan in either TIFF or PDF format. A PDF is a document file which can be viewed through Adobe Reader. A TIFF is an image file which can be viewed through Windows Image Viewer or other image viewing platforms. It is up to the member to determine which option is best for their purposes. Clicking on this icon will open the plan in a PDF within the browser using Adobe Reader. The plan can then be viewed, printed, or saved on your computer to view later. 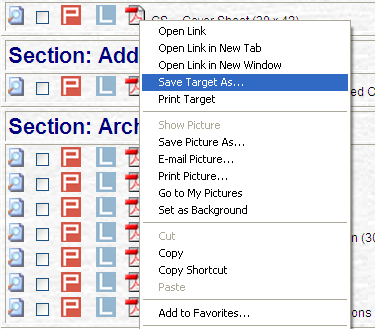 You also have the option to save the PDF file of the plan to your computer without opening it by RIGHT clicking on the Adobe icon, choosing “Save Target As”, and saving the PDF in the folder of your choosing. Note: Your menu may appear different when right clicking on the Adobe symbol depending on what internet browser you are using. All instructions in IPIN Tip of the Month are shown using Internet Explorer. Internet Explorer is the recommended browser to use with the Builders Exchange of Kentucky. To the left of the red Adobe symbol is an icon displaying a blue square with a white “L”. This icon stands for the IVS Lite Viewer (IVS stands for IPIN Viewing System). The Lite Viewer is a quick and easy way to view multiple plans on the same project. It provides a number of useful tools, such as a magnifying tool which can quickly zoom in on specific areas of a plan. 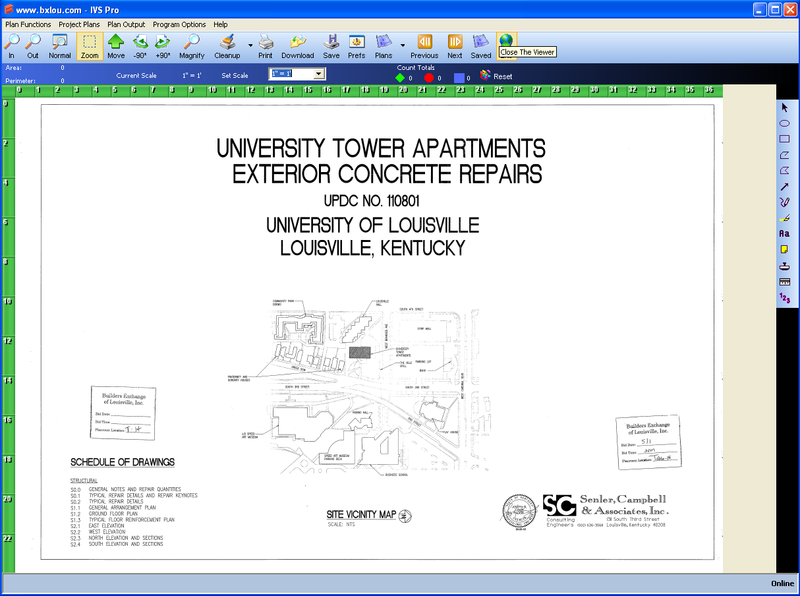 Plans can also be saved on your computer in TIFF format while viewed within the Lite Viewer. This icon launches the IVS Pro Viewer. The Pro Viewer is a heavily upgraded version of the Lite Viewer that grants users the tools to mark up and takeoff projects directly from your computer. 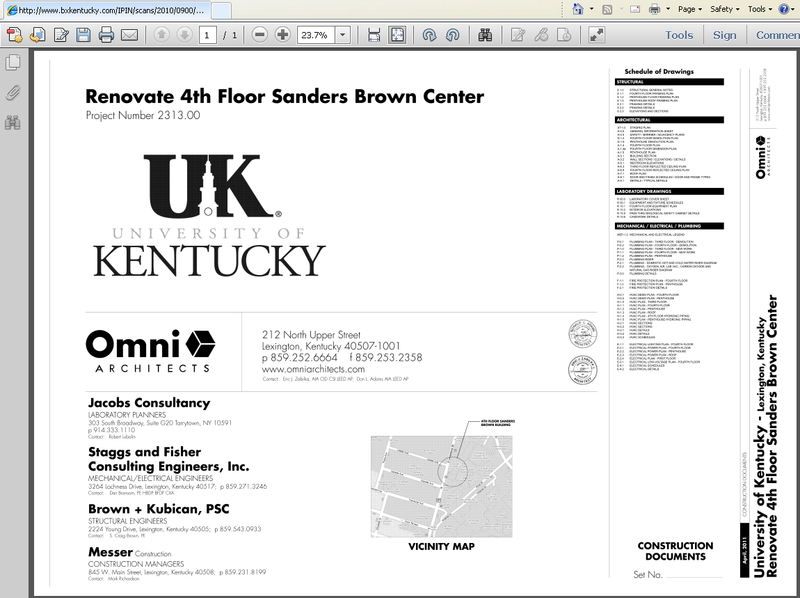 Like the Lite Viewer, the IVS Pro Viewer must be installed before plans will open in the program. To download and install the Pro Viewer installation files, click on the “Get IPIN Viewing System Pro” link at the top of the page (above the “My Projects” icon and next to “Get Adobe Reader”) and follow the installation directions. Call 502-459-9800 if you require assistance. This covers the different options for viewing plans on the IPIN system. Next month I will cover how to use the different features and tools associated with the Lite Viewer. You can also join us for free online training on Thursday, June 21 from 10-11:30 a.m. The next training sessions will be held on June 22, 2012 (Lexington) and July 20, 2012 (Louisville). Call me, Aaron Thomas, at (502) 459-9800 or e-mail athomas@bxkentucky.com to RSVP for training! If you have any questions, comments, or suggestions for IPIN Tip of the Month, comment below or e-mail at the address listed above.